Learn how download and install CA SiteMinder Option Pack. The SOA Software Policy Manager CA SiteMinder Integration Option Pack (com.soa.security.provider.siteminder_7.X.XXXXXX.zip) includes a repository.xml that contains the SOA Software CA SiteMinder Security Provider and SOA Software CA SiteMinder Security Provider UI features. Install the SOA Software Policy Manager CA SiteMinder Integration Option Pack zip file to each Software Platform (sm70) location. Copy the com.soa.security.provider.siteminder_7.X.XXXXXX.zip file into the SOA Software Platform release directory (\sm70). Extract the .zip file to the sm70 directory. Click the Available Features tab. The SOA Software CA SiteMinder Security Provider and SOA Software CA SiteMinder Security Provider UI features display. 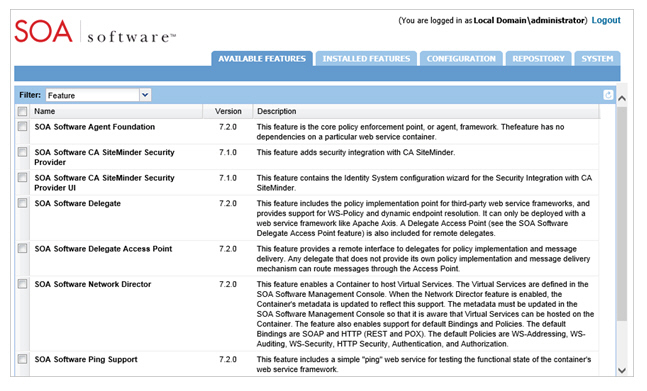 Next step in the CA SiteMinder intregration process is to Install SOA Sofware CA-SiteMinder Security Features.